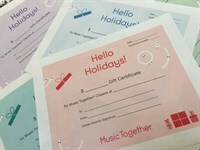 Eastside Westside Music Together - We Offer Gift Certificates! Give the gift of Music Together® to anyone in your life with a baby, toddler or preschooler. We have classes for children from birth through five years, and the grownups who love them! A quality music experience lasts a lifetime and builds joyful memories for the whole family! Choose a gift certificate for a full semester of classes or partial tuition. Please tell us the name of the recipient in the comment field as you're checking out so we can personalize your gift certificate. Your digital gift certificate will be emailed to you within 48 hours.